Who does not love a good salmon, its buttery flavour and delicate texture is addictive. One of the best seafood there is and its life cycle has attributed to its texture and flavour. Unlike any other fish species salmon have a really great life cycle which is very interesting. Their life starts as eggs like other fishes where they are laid in freshwater streams in high altitudes, once hatched they stay in the stream for 6 months to three years the first develop vertical stripes (parr stage) until they develop a bright silver colour (smolt stage) as they age. At this moment there are only 10% who will survive, as a smolt their body chemistry changes which allows them to live both in salt and fresh water. Salmons then spend 1 to 5 years in the open ocean until the time they are sexually mature and once ready they then travel back to their natal stream to spawn. It’s a wonder how they could navigate back to where they were born first because it’s a long trip up stream and sometimes involves rapids and short drop falls and they can locate in pinpoint accuracy the exact place where they were hatched. If you put that in numbers a typical salmon can travel over 1400 kilometers and climb 2.1 kilometres from Pacific Ocean to the stream where they were hatched. Isn’t that interesting? I guess there are only few fish species that can do this, do you know of some? 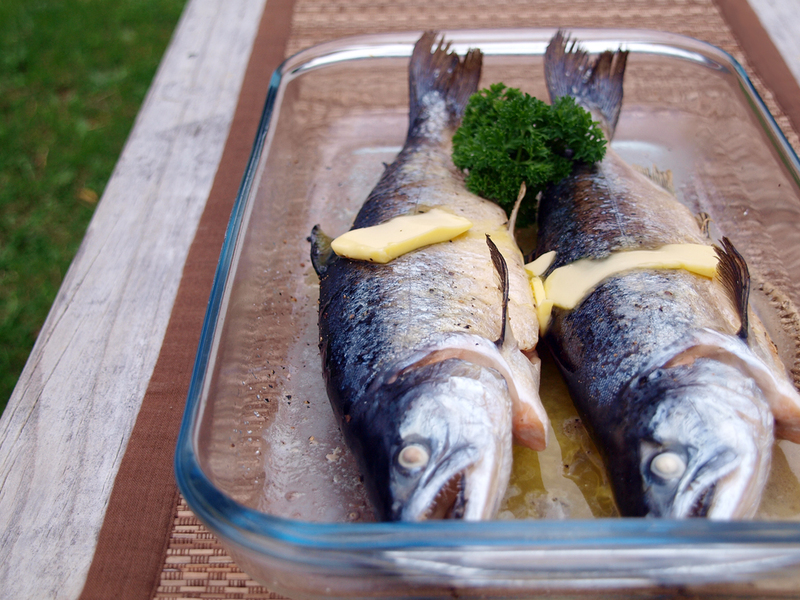 For today we will be featuring this awesome fish, a simple baked recipe to enjoy its truest flavour. Rub minced garlic on salmon in the cavity and outside. Generously season it with salt and pepper. Grease a baking pan with melted butter and place salmon. Bake in a 220C preheated oven for 20-25 minutes or until lightly cooked. Remove from oven then place slices of butter on top and spread it across while melting. Fantastic post and simple yet delicious way to prep this fish. The simplest of meals done right will always come out the best. This is great 😀 ! Wonder if the same recipe can work for chicken 😀 ? What a beautiful post, i love fish. A simple treatment is always best with fish. This looks wonderful. I adore salmon (and garlic), but I haven’t cooked one whole as yet … something about it staring back at me, so I buy fillets. 😉 They do make a remarkable journey. We always have fresh salmon in the markets but never the small whole ones like yours. I’m sure they are delicious. I’ve never cooked a whole fish before…need to learn how to do that. I love the butter and garlic with this. Perfection! I adore the texture and taste of salmon, and the way you prepare it is perfect! Such a simple recipe! And so easy! With fish, I find simple often is better. Salmon in particular – it has such great flavor that it doesn’t need much. But the garlic? Yes, please. And I’ll put butter on anything. Thanks. Salmon is my hubby favorite.. Honestly I am not so big of a fan of it but I do enjoy good cooked ones..
this looks yum and I love learning about it from your post. I always find the salmon migration home fascinating! It’s amazing how they find the inlet to a big river and even a tiny stream. I hate to eat them sometimes but when they return home they’ll die anyway, so why not. I love the flavor and texture of wild salmon and totally agree with you – it doesn’t need much seasoning at all! Beautiful salmon you have there! I’m trying to add some fish into my diet for the omega 3s. This looks about as easy as it gets! Love this recipe, simple and so tasty…what a nice recipe to bring the flavor of salmon. That looks simply amazing! I love simple recipes and yes sometimes it’s best to enjoy the truest flavour of a dish! Salmon is one of my favourite fish!